Greece has done its part and this is recognised by the majority of the lenders, Prime Minister Alexis Tsipras said at the Hellenic Federation of Enteprises (SEV) annual general assembly on Wednesday, marking the 100th anniversary since SEV΄s foundation. According to AMNA, Greece will accept a solution on the debt that guarantees its immediate access to the markets on sustainable terms, he added, noting that the country΄s creditors - including the European Central Bank - must now assume their responsibilities. "They have a moral and legal obligation to do this," he added. The prime minister also called on the healthy forces in the country to assist in an exit from the crisis and the memorandums, urging the start of a dialogue marked by mutual respect, on the basis of the principles of democracy, "in spite of our known disagreements and views". "The future of the economy for many decades will be judged at this time. 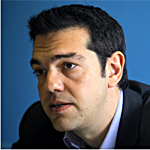 We must be united before a goal of national importance," Tsipras said. The demand for sustainable growth and a national plan for radical changes had yet to be fulfilled, he said, while the years of crisis had amply demonstrated that the previous production model had failed. This model would have to be redesigned in order for Greece to exit the crisis and the country was now asking its creditors to meet their own commitments, enabling Greece to access the markets on its own merits. "A clear solution for the Greek side is one that does not generate insecurity for investors. At this time, both Greece and Europe have the capability to provide such a solution," the Greek premier noted. Tsipras said the government was currently working hard so that differences with all the lenders might be bridged and everyone arrive at a positive sustainability analysis for Greece΄s debt. He also pointed to current heightened interest displayed by investors, who he said were waiting for a clear signal that the third Greek programme will be successfully concluded. He stressed, however, that any solution put forward must be commensurate to the sacrifices of the Greek people.